SIYSSA SHOOTERS MADE THE 2019 AIM ANNUAL TEAMS! 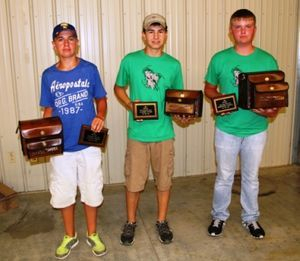 SPARTA, IL- The Southern Illinois Youth Sport Shooting Association (SIYSSA) hosted its second annual Invitational at the World Shooting & Recreational Complex in Sparta on Saturday and Sunday, September 27-28, 2014. The two-day event attracted 164 Junior and Senior High athletes from Southern Illinois and Missouri to compete for awards in both individual and team categories. 200 single targets were shot on Saturday with handicap and doubles wrapping up Sunday's activities. Hamilton County Fox Fire won both the Senior High and Junior High Divisions allowing them to take home the Shawnee travelling trophies for both. 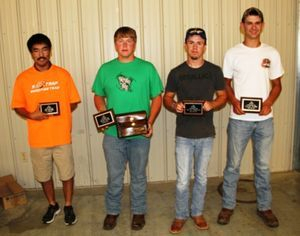 Hamilton County Fox Fire's Trase Smith, Garrett Craddock, Jake Whipple, Sean Paul Trotter, and Tyler Morrison broke 959/1000 targets to be named the Champion Senior High team. 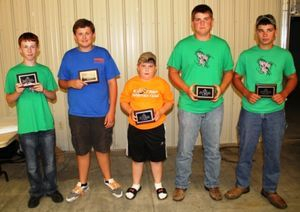 For Junior High, Fox Fire's Kolby Darnell, Cole McMahon, Sky Braden, Kolten Phillips, and Jacob White broke 846/1000 targets to earn Champion for their division. For complete results. 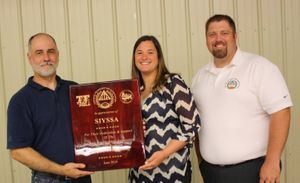 Also at the event, Emily Zollner, ATA AIM National Coordinator, and Troy Kueker, ATA AIM Marketing Director, presented SIYSSA with a plaque honoring SIYSSA for their dedication and support of the Amateur Trapshooting Association's youth AIM program. 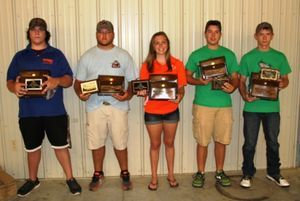 SIYSSA, a non-profit corporation formed in 2012, is dedicated to promoting trapshooting and other shooting activities for the youth of Southern Illinois. SIYSSA supports the activities of each member team by encouraging safety, good sportsmanship, and responsibility. SIYSSA is committed to developing youth trap shooters, age 5th-12th grade, to compete both individually and through team effort by hosting monthly trap shoots in the Fall and Spring of each year.